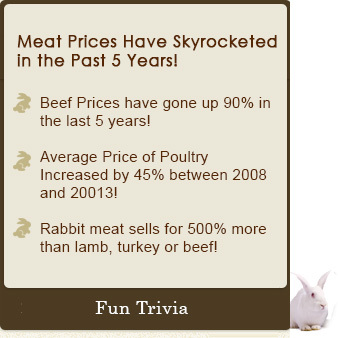 Rabbits for Meat, Fun, and Profits!! Breeding rabbits isn’t just for 4-H projects any more—it is big business and thousands of home based breeding operations are springing up to fill the surging demand. But I know—for rabbits?!?! High energy prices, stagnant wage growth, and the largest credit crisis in recorded history is putting a severe strain on everyone’s budget—to the point that we are all finding it painful to buy simple meat staples like beef, chicken, and pork! Breeding rabbits can be a great way to help offset these staggering prices either by selling them to local meat markets or by adding them into your own diet. Breeding rabbits for meat has become increasingly more profitable because per capita consumption has increased by a staggering 50% since 2000! This trend will only continue as high corn prices continue to make more traditional meat too expensive to buy on a regular basis. In the U.S. alone, there are an estimated 5,000,000 rabbits being kept as pets in over 2,200,000 homes. The trend towards keeping rabbits as pets has also increased since 2000 in part because they cost a mere fraction to maintain when compared to more traditional pets like cats and dogs. Bunnies also require far less care, time, and effort to maintain making them more convenient for today’s busy pet owners. And dollar for dollar, breeding bunnies is more profitable than breeding dogs or cats due to lower feed, vet care, and other associated breeding costs. No, you may not make as much per litter with rabbits when compared to dogs or cats-but you will invest less money, time, and effort while having more litters and making a greater return on your initial investment. Take Rabbit Breeding Seriously and Make Some Serious Money? You don’t need mere tips on rabbit breeding to be successful—you need a comprehensive guide taking you through each step of the process! From selecting the breeding pair to preparing for potential birthing complications, breeding bunnies is not as simple as just putting a pair of rabbits into a cage and “letting them do their business”! ✔ And Much, Much More! Even If You Have Never Owned a Pet Before, Breeding Bunnies: The ‘No Stone Left Unturned’ Guide to Breeding Bunnies Is All You Need to Be Successful and Profitable! ““I Had Never Even Owned a Dog But Now I am Breeding Rabbits In My Spare Time!" LESS Fat than beef, pork, turkey or oven chicken! Breed For Profits, Healthy Meat, or Just For the Fun of It -- Guaranteed! secrets of breeding bunnies for fun and profit! 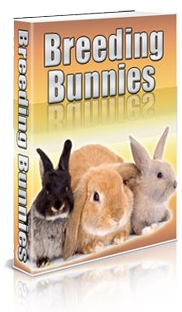 Even if you have never owned a pet in your life, Breeding Bunnies provides you with the information and step-by-step instructions you need to raise successful litters—whether for profit or fun—guaranteed. So, if you are not satisfied for any reason—any reason whatsoever—that Breeding Bunnies is the most comprehensive, step-by-step blueprint to successful rabbit breeding—then return it within 60 Days for a full and complete refund. No questions. No hassles. No gimmicks. Breeding Bunnies Leaves Absolutely No Stone Unturned! ✔ Learn How To Save Money By Making Your Own Nursery Hutches! ✔ Learn How to Avoid Genetic Defects! ✔ Read How to Breed For Color, Size, and Other Traits! ✔ How To Maintain the Breeding Hutch! ✔ Feeding Secrets for Both Mom and Her Newborns! 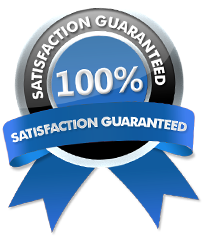 ✔ NO STONE LEFT UNTURNED—Guaranteed! ✔All For Just $17.00 $29.99 ! Whether looking for a reliable source of healthy, low-fat protein, some extra income, or just to have some fun for yourself and your children, Breeding Bunnies goes beyond simple tips and tricks and provides a complete guide to successful bunny breeding! With an industry-shattering 60-day Money Back Guarantee and food prices heading skyward, you can’t afford NOT to order Breeding Bunnies TODAY!